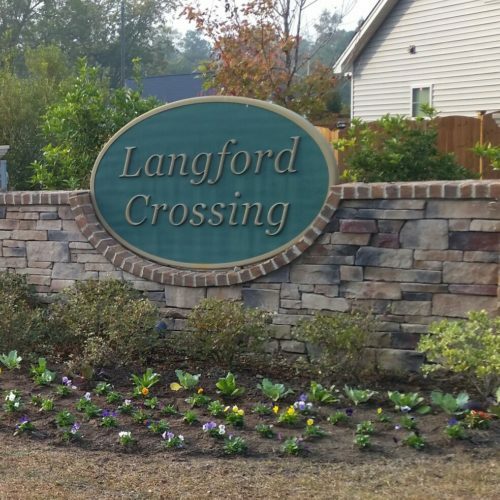 Langford Crossing is a finished 60-acre residential community located on Langford Road near the Town of Blythewood, SC. Developed under Richland County's Green Code Ordinance, LandTech permanently designated 50% of the land as natural and conservation areas, so most of the homesites overlook natural protected areas including a fishing pond with a community playground nearby. Mungo Homes and Fortress Builders served as the building team to offer attractive semi-custom homes from the $160's with durable vinyl exteriors featuring brick and stone accents. Langford Crossing also offers residents a three-minute drive to the beautiful Doko Meadows Park which boasts an amphitheater, walking trail, event center, and sports fields all managed by the Town of Blythewood. Students are zoned for Langford Elementary, Muller Road Middle, and Blythewood High Schools in Richland School District Two.